The Educate Awards 2017: Winners announced! Educate Awards 2017: Winners announced! Schools across the region have been honoured at the prestigious Educate Awards 2017 ceremony last night (Friday 17 November). 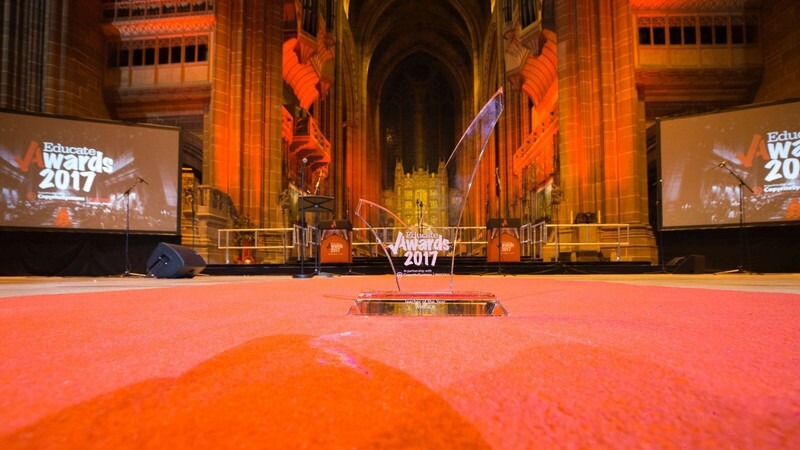 Nearly 600 guests gathered for the Educate Awards ceremony held at the Liverpool Anglican Cathedral, hosted by broadcaster Simon ‘Rossie’ Ross. The awards, in partnership with Copyrite Systems and Ricoh, is now in its sixth year and is the biggest celebration of education in the North West. On the night, 21 awards were handed out to schools in the Liverpool City Region, Lancashire and Cheshire. The opening act was a 300-strong Super Choir led by musical director Steve Cook from Formby High School. Participating schools included Formby High School; Freshfield Primary School; Redgate Primary School; Saughall All Saints CofE Primary School; St Anne Stanley Primary School and Valewood Primary School. Guests were also treated to music from St John Rigby College students; a special performance of Beauty and the Beast Jr by Archbishop Blanch School; a fashion show by Holly Lodge Girls’ College and a spoken word performance by five students from The Hollins Technology College. Kim O’Brien, founder of the Educate Awards, says: “The Educate Awards is an opportunity to shine a spotlight on the teaching profession and say thank you to the remarkable individuals who improve the life chances of our children. The winners were chosen by an esteemed judging panel which includes Michelle Dow, managing director of All About STEM; James Tartt, Merseyside track athlete and architect; Radio City breakfast host Leanne Campbell; Councillor Gary Millar, assistant mayor & mayoral lead for business & international trade; Chris Walker, regional managing editor of Trinity Mirror North West and North Wales; Lesley Martin-Wright, chief executive of Knowsley Chamber; Fiona Barnet, director of The Foundry Agency; Andrew Pimbley of Wirral’s Claremont Farm; Sue Cronin, head of teacher education at Liverpool Hope University and the education team at the respected Everyman and Playhouse Theatres. Held in partnership with Copyrite Systems and Ricoh as title sponsors, other category sponsors include Liverpool John Moores University (LJMU); The Foundry Agency; Wray Brothers; Paul Crowley & Co; The Bishop of Liverpool, The Rt. Revd. Paul Bayes; MILK Education; The Liverpool Learning Partnership (LLP); Shaping Futures; All About STEM; Hi-Impact Consultancy; LSSP; Air Products; School Improvement Liverpool; CER Education, DMR David M Robinson Jewellery & Watches, and Progress Schools.